New England's premier jazz label since 1987. 1992 debut, full of originals and a rewrite of a well-known standard called "C'era Chi?" "Challenging yet accessible disc...this album swings with fresh intensity." Personnel:George Garzone, ts, ss; Luigi Tessarollo, g; Douglas Yates, as, bcl; Lello Molinari, bs; Matt Wilson, dms. Tracks: 1.C'era Chi? ; 2.Blues Anyone? ; 3.Stuntman; 4.No More Mr. Nice Guy; 5.Your Child; 6.The Wall; 7.Goodnight Sweetheart. 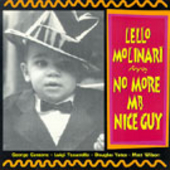 1995 release features compositions of bassist Molinari, originally from Monza, Italy, and saxophonist George Garzone, a Boston legend whose international reknown growing through work as a sideman, his long-standing trio The Fringe, and a new solo album. 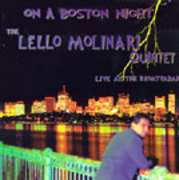 "Molinari and his group are at home in the mainstream tradition and also savor the freedoms jazz forged in the sixties and seventies. Garzone is one of the country's brawniest and brainiest tenor players" (Musician) Douglas Yates (Either/Orchestra, Mandala Octet, Ken Schaphorst Band) burns on alto and bass clarinet, Bob Gulotti, Garzone's partner in the Fringe, is one of the tastiest drummers alive, and Rick Peckham's guitar work takes off from pre-Mahavishnu John McLaughlin. "Four Stars...in your face, a little raw, fiercely alive." Tracks: 1.There's Snow Place Like Home; 2.First Dance; 3.The Mingus I Knew; 4.Echoes of Rome; 5.Hey, Open Up! ; 6.Nothing Cheap.